Been to Yellowstone many times. Only been to Mammoth a few. It is kind of out of the way. Hi Craig, yes, Mammoth is out of the way and fewer visitors venture here. I’m glad you’ve been to Yellowstone many times–so much to see, one visit is not enough. There’s a lot to take in and it’s always changing, too. Many thanks. Yellowstone is one of a kind and well worth a visit. We’ve taken guests during the summer when we’re in Wyoming and it always amazes. It truly is one-of-a-kind, I agree, Janet. So much underground activity and vistas above-ground, too. Thanks so much for your visit today. Have a wonderful weekend, Jet. I’m happy you enjoyed today’s visit to Yellowstone, Sylvia, and glad it reminded you of happy times when you were there. Thanks for stopping by today. 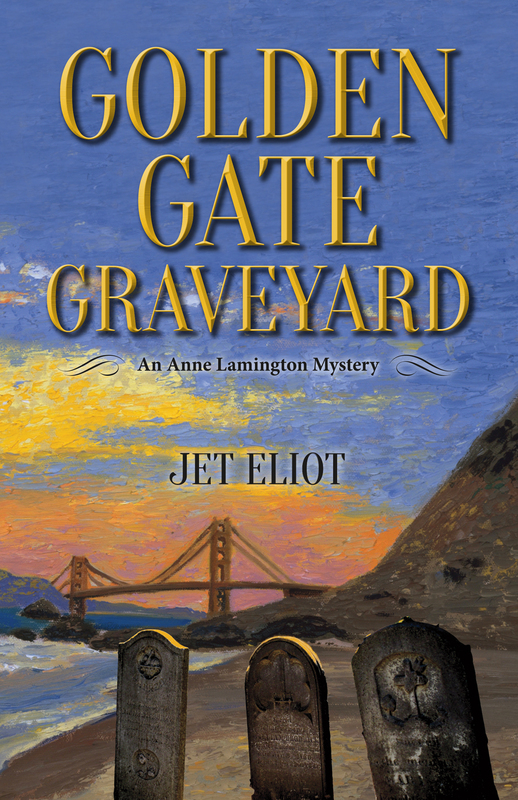 I read a mystery by CJ Box recently, and much of the action took place in the park. Between that, and your post today, a visit has moved up on our list! Thanks, Jet, and have a wonderful weekend. Sounds like Yellowstone is weaving its way into your thoughts, PC, with this post and the mystery too. I’ve heard the dead of winter has less visitors, and you being a snow person might like it. Mammoth is open all year round, unlike many parts of Yellowstone. Truly a place you should visit, astounding features and endless beauty. So glad to see you, my friend, and my best wishes to you and Mrs. PC for a terrific weekend. 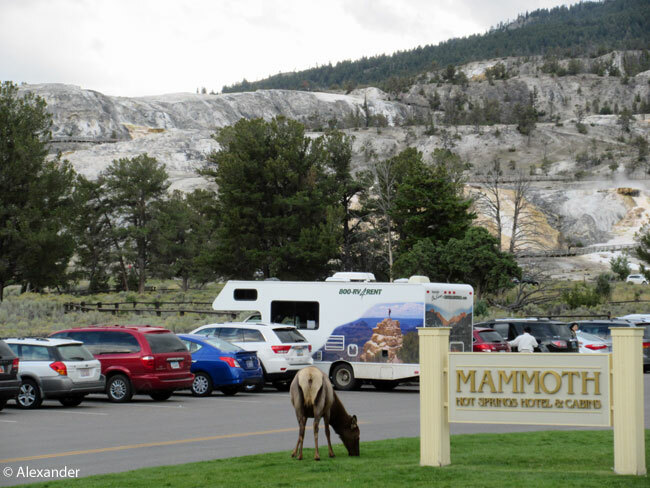 Your photographs and story of Mammoth are exceptional and much appreciated as Pam and I thoroughly enjoyed our time at Yellowstone and did not make it to Mammoth. bingo. I appreciate your comment, Michael Stephen, because I was aiming to inform Yellowstone visitors who may not have had a chance to visit Mammoth, or were thinking about bypassing it…just as you said. There is so much to see and do in this huge park, we cannot see it all. Many thanks. I’ve never been to either area, but Yellowstone is on my bucket list. These photos are incredible! Thanks for the education, Jet. I’m happy to have shared Mammoth with you, Jill, and Yellowstone in general. I did another two-part series about the geothermals in Yellowstone, so when this magnificent place inches up on your bucket list, you know where you can go to see more photos. Always a joy to have you visit, Jill, thank you. I’m laughing, David, happy with your comment. The heat and fervor and fire of Yellowstone is always alive, makes for a unique place. Yes, a lot like Geyserville on steroids…I’m laughing again. Many thanks for your delightful visit, my friend. What a treat to take you to Yellowstone, Lola, I’m happy you enjoyed the adventure. I always enjoy your visits, much appreciated. Such a fascinating place! I do wish I can visit it sometime. Thanks for the interesting article and beautiful photo’s, Jet. 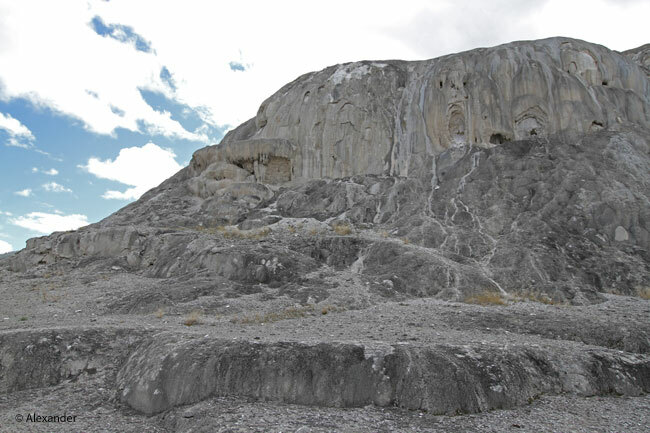 I enjoyed the research and composition of this Mammoth Springs essay, Dina, and I’m delighted you enjoyed it too. I agree with you, it is truly fascinating. Thank you. Thanks again for information and great shots. A true joy to share the marvels of Yellowstone with you, Cynthia. Thank you for stopping by. Wonderful photos bring back good memories! Yellowstone is such a unique place, we never forget our experiences here, do we, Cindy. Thanks so much for your visit and comment — cheers to you. I enjoyed hearing about your visits to Yellowstone in the ’60’s, washekoda. The dependable timing of Old Faithful is a pretty big thing there, so I loved hearing the Anchorage EQ changed the timing. I find this fascinating. Thanks so much for your contribution and visit, my friend. Beautifully captured, Jet! Thank you for including the information. Yes, you’re absolutely right, Amy, this truly is a grand place. I’m happy you’ve been there. Thank you so much for your wonderful visit today. Thank you for the re-blog, huggers. That is one big park! I’ve never been there, but hope to one day. As our most visited park, it would have to be in the off-season, I think! 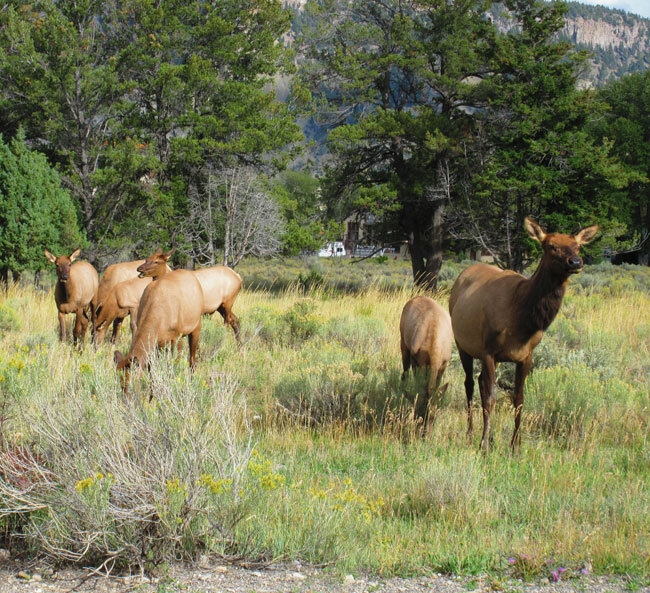 Yes, Yellowstone, in all its grandness, does attract millions of visitors, and due to the harsh winters, they mostly come in the summer months. We stayed away for a long time for this reason too, Eliza. Then when we did go, it was the second week of Sept. There were still a lot of people, plus the park system was repairing the roads and there were often long waits and closed-off areas. If you don’t mind snow, winter might work best. Glad I could bring the beauty to you, my friend. Thank you. You sure have seen and done some amazing things! Thanks for sharing them. These land formations are something out of the ordinary and we don’t often think about them – tending to go for forests, mountains, and water systems, but – this is really interesting and different. I’m the same way, anneli, tending toward forests, mountains, and/or water. 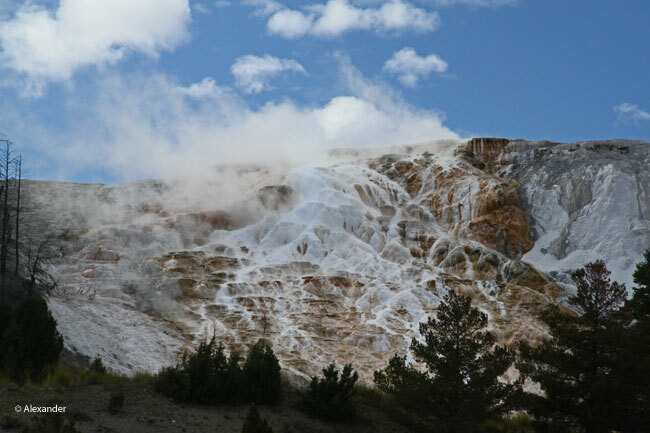 These geothermals in Yellowstone are fascinating, unusual, and so abundant; I’m so glad we made it a priority. I’m happy I could share it with you, thank you for your visit, always appreciated. Looking at the map, Mammoth seems relatively close to us. Well other than the state of Montana in between. I confess I had never heard of it before. Also incredible about the amount of travertine deposited every day. Hard to even fathom that amount flying into the air and splashing back down. I was surprised to read so much travertine is deposited daily, too, Sue. Two tons!! I consulted several sources and they all concurred. I’m glad I could bring Mammoth to the radar for you. My warmest thanks and wishes to both you and Dave. Fascinating! I don’t think we ever visited this area and am sorry we missed it. Sounds as if it’s worth a return trip! Thanks! Yes, Mammoth is kind of hidden away on the northern side of the park, and indeed, fascinating. So glad to bring Mammoth to you, Nan, thanks so much for your visit. 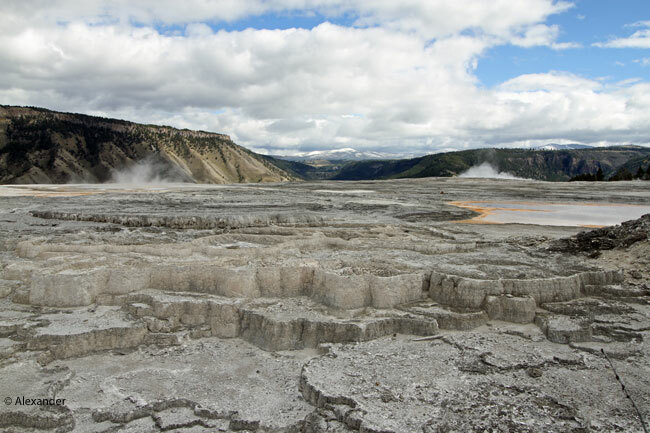 Yellowstone is a wonderful park, so much to see and enjoy. I am really glad you have been here, HJ, and that you enjoyed it. I am honored to have brought back pleasant memories of this very special place in the world. Many thanks, my friend, for your wonderful comment. Wonderful photos. 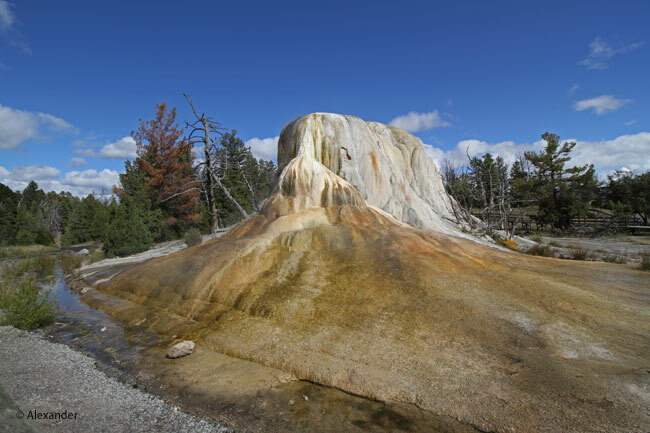 I enjoyed being able to visit Yellowstone virtually via this post. There are so many places to see in the world, and sometimes a virtual tour is just the ticket. I am delighted to have brought you the wonders of Yellowstone, Sheryl. Thanks so much for stopping by. Very nice presentation of Mammoth, and great photos as always! I would imagine you have seen lots of Yellowstone and Mammoth, montucky, so your complimentary comment is much appreciated. Always a joy to have you stop by. Yellowstone is a beautiful park. We always love visiting there. I agree, Bill, and how fortunate we are to have this preservation to return to again and again. Many thanks. Every time I see pictures of Yellowstone it is a big joy for me! One has insight into the origin of the earth, just faszinating!! Great point you bring up, Simone, the fiery earth and it’s ever-moving base is so alive in Yellowstone. It is thrilling to see the earth in action, isn’t it? Thanks so much for your thoughtful comment. Yes, Jet, it makes me humble. Oh yes, you and Ben would really like Yellowstone, Peta. It is a lot like another planet, you are right about that. It is really cool to look across the landscape in the mornings when the air is still cool, and see all the steam rising in numerous places. I’m glad you enjoyed the post, and appreciate your comment. I hope you avoided the summer crowds. Love to see Yellowstone. Thanks for the tour. You have a great point, Sherry. The summer crowds are now summer and autumn crowds, and it is the one thing about Yellowstone that I had a difficult time with. Many people who visit here are not quiet hikers and lovers of wilderness, either, so the outdoor experience is actually quite urban in essence. Cell phones, loud voices, etc. With all this commotion, the wildlife is very far away and difficult to find. We saw one moose in two weeks, for example; and all of sudden with that spotting, there were 50 people, all of us huddled under one tree stepping on each other in an effort to see him. So I’m glad I could bring you a tour via the blog, my friend, and wishing you the very best. 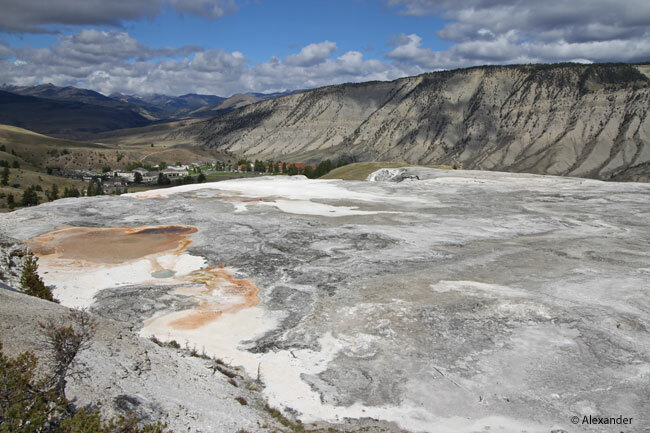 Will have to check out Mammoth hot springs next time ~ your shot of the Travertine Terraces are one of the reasons I need to go 🙂 Great shot. The travertine terraces are pretty cool, Randall, you would like them. Thanks for your kind comment and visit. Wonderful post Jet. Yellowstone is one of my most favorite places. Oh I am so glad to hear that Yellowstone is one of your favorite places, Sylvia. And I am really pleased that I could bring it to you this weekend. My warmest thanks for your visit. Beautiful photography, I’ll be visiting Yellowstone in August. My brother lives near Yellowstone. As always thank you for your wonderful tour, Jet. The brother who is the recipient of the excellent birthday cards you make for him. I think of him as The Lucky Brother. lol. I’m glad you’ll be visiting Yellowstone with a resident, Sharon, he’ll know all the places to take you where there are less tourists. So glad to have brought you along to Yellowstone this weekend, my friend. And, he is a wonderful tour guide! Your wonderful comment brought a smile to my face, Frank. I’ll pass on the word to Athena, too. Thanks so very much. Finally, somewhere I have been that you have, Jet! That’s just in gest, I love your travels, shared stories, and Athena’s captures of the world I’ll never see myself. A delight to know that you and I were both in Yellowstone, no doubt on our endless stalking of birds. lol. I so enjoyed your lovely comment, thanks so much, Donna. Thanks as always for the delightful tour. The one time I got to visit Yellowstone (1979), I was pushing it to make it back to work in Placerville from visiting family in Boston. I didn’t get to see a whole lot so I truly enjoyed this vicarious visit you and Athena provided! I covered quite a few miles between the east and west coasts. Sometimes I didn’t take as much time as I might have preferred. But at least I had a taste. I think we’ve all been in situations where we didn’t get to stay somewhere as long as we would have liked to, but as you say, Gunta, at least we get “a taste.” I know I haven’t seen nearly as much of the Pacific Northwest as I would like, but I sure enjoy all your posts and the scenic adventures you provide. I am glad you had a chance to see a bit of Yellowstone, and really glad I could provide you with a vicarious visit. Always a joy to connect with you, Gunta, thank you. I wish, that I could visit there someday! Very inspiring post and stunning pics. Thank You. I’m happy I could share Yellowstone with you, Matti. It’s a long way from Finland, so this was a convenient way for your to visit. My warmest thanks for stopping by. It truly is an awe-inspiring place, Iris. Thanks so much for your visit, always a joy to “see” you. Great post Jet. Yellowstone Park is such an amazing part of the world. 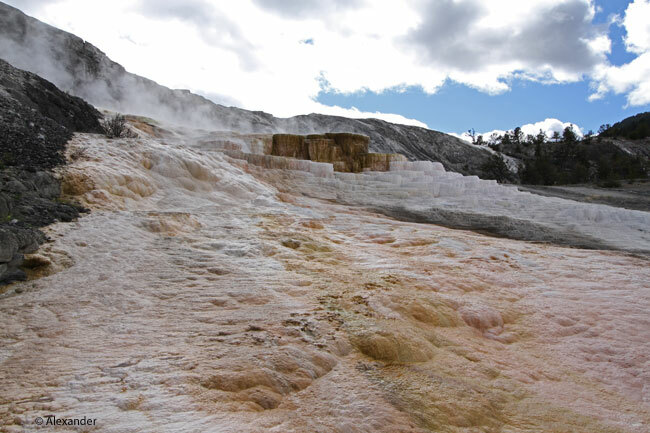 Hard to imagine the sheer size of the magma chamber below the park when you see how widespread the hot spring activities are! I’m happy you enjoyed Yellowstone, Dave. You offer a good point, the magma chamber below and its size, given the immensity of the terraces. The travelers that you and Sue are, I imagine you have been to this lovely hotspot. Hot for so many reasons. Many thanks and cheers to you both. Thanks very much, Mackenzie. Yellowstone presents so well in all its beauty. I haven’t been there since I was a child. I only remember the buffalos! There are still lots and lots of bison. It’s the most prevalent mammal. Glad you enjoyed this visit to Yellowstone, Jan — thanks for stopping by. Excellent post Jet. Informative and wonderfully photographed. Yellowstone is an amazing place. I’ve only seen it once, back in 77. Yet another place that deserves a return visit. There’s always so much to see in Yellowstone, I think we could go back and back and back and still not see enough. I’m glad you’ve had the pleasure of visiting Yellowstone, Dave. Thanks very much. I enjoyed your comment, ACI, thank you, as always. 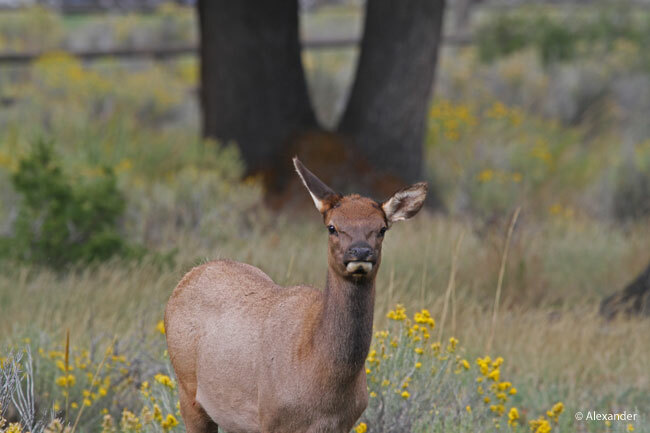 I thought that was a fun photo to end the post with, that elegant elk cow looking straight at Athena, giving attitude. Glad you liked it. I hope your week is going well, my friend. This all looks amazing! 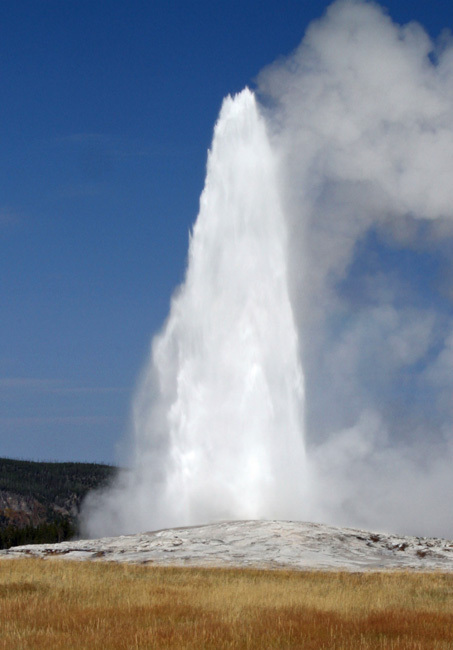 I’ve been on / at a small volcano in Italy – exciting – but I’ve never seen a geyser. I think Iceland would be my nearest… now you’ve made me want to do this, Jet. Iceland is another land of great geothermal activity, being a volcanic island. Although I have never been there, I’ve seen photos and it looks incredible. I hope you are able to swing by there someday, RH. Thanks so much. Haven’t been there since I was a kid…..I feel a road trip calling!! Enjoyed your comment, Kirt — the call of the road trip. Always fun. Many smiles and thanks….